Beer range a bit bland if you ask me. Mind you, if it was packed & a band was on - I would think differently! Rockers pub not too far from Bolton station, but far enough in the snow. It's a Marstons pub which had only one other customer when we visited yesterday lunchtime. Beers on were Wychwood Hobgoblin, Marstons Old Empire & Jennings Cockle Warmer. Cider was Thatchers Heritage. I see the similarity with the Witchwood in Ashton, having visited there recently. For me, the Witchwood was better. 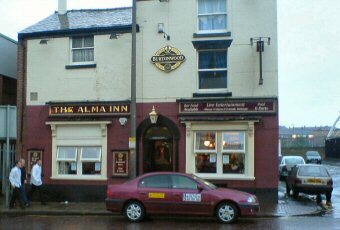 I like this pub its a bit like the Witchwood in Ashton under lyne but a bit more rough and ready. Its a bit tucked away so id have it as a starting point. Best way to get there is turn left out of the train station then left at the next set off lights and its on your left hand side. Beer kept on form and the lad behind the bar was very friendly. Called in here for the first time despite living in Bolton for over 7 years. A good choice of cask ales, the Cumberland was well kept. However the put itself is far from endearing, with peeling wallpaper and a general decrepit look. The toilet has broken tiles, graffiti and no soap, dryer or handtowel. Due to this, although the beer was good I can't recommend the pub sadly.